North Beach Cabins are Eco-tourism accommodations set in the majestic Naikoon Park on the legendary Queen Charlotte Islands/Haida Gwaii. Located on Tow Hill Road, ten miles east of Masset, British Columbia, this private and pristine wilderness is an ideal rustic retreat for a remote vacation. Our four cozy, weathered cedar cabins are surrounded by acres of coastal rainforest and miles of sandy beach waterfront. North Beach Cabins provide our guests a unique opportunity to experience one of the last natural frontiers, unspoiled by urban development. Here you can enjoy a back-to-nature adventure and a getaway from the hustle and bustle of daily life. Walk for miles on sparsely populated beaches and hike through the lush canopy of the moss-lined cedar rainforest. The Queen Charlotte Islands are renowned for its art, culture and history. Sport fishing, surfing, kayaking, hiking, cycling and golf are just a sampling of the endless activities for the outdoor enthusiast. Nature lovers will be awe inspired by the variety and abundance of wildlife. Bird and whale watching are two of our most popular activities. Guided Ethno-botany and Eco-tours are available daily. Crabs, scallops and razor clams may often be harvested steps away from the cabins. Long leisurely strolls on the beach provide opportunities for shell seekers and agate hunters to gather incredible treasures. North Beach Cabins are a haven in the midst of nature's gallery. We invite you to come and relax, enjoy nature's best, and embrace all we have to offer. North Beach Cabins provide our guests with all the basic necessities; complete with full service kitchenettes including four burner range ovens for cooking, wood or propane stoves for heat, propane lantern or candle lighting, cold running water and well maintained outhouses. Each cabin contains a deck for lounging and viewing the beauty all around. The town of Masset is close by and a short jaunt for laundry or shower facilities, acquiring groceries, or most all other provisions. Our four distinctively different cabins are described as follows: All prices are based on double occupancy. LET THE SURF BE YOUR PULSE at the Moon Shell. Nestled in a fringe of young mossy rainforest, this beautiful and very private cedar-shake beach cabin retreat sits directly on the dunes. This roomy 16'X24' cabin sleeps 4. The cabin has two large decks; a sunny south deck fronting the dining area, and a north deck facing directly in to the breaking surf 100 feet away. The Moon Shell features a sleeping loft, a skylight, pine-planked walls, and a cozy wood stove. 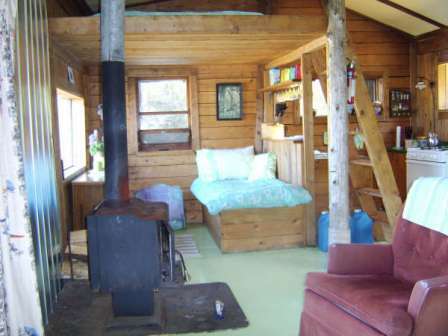 The cabin is furnished with a futon sofa/bed, dinette and sitting area. AWAKEN TO THE SCREECH OF BALD EAGLES at the Scallop beach cabin retreat. Perched atop the forested dunes, this cozy, bright cedar-shake on the outside and inside pine tongue and groove paneling located six miles east of Masset, BC in the Queen Charlotte Islands offers a breathtaking view overlooking the beach from the front room and north deck. This 235 sq.ft. 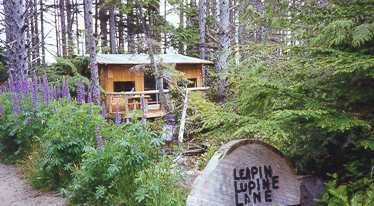 beach cabin retreat on the Queen Charlotte Islands, BC; sleeps two. This cozy cabin features propane heat, light and cook stove, cold running water. It is furnished with full kitchenette, sitting and dining area on top level; and sleeping area on the lower level.The Scallop cabin is only a two minute leisurely walk through the young mossy rainforest to the beach. 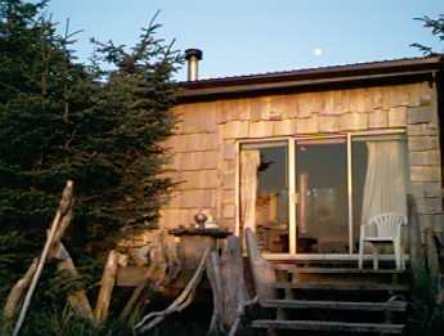 WATCH THE WETLAND INHABITANTS play from the sunny and sheltered south-facing deck of the Sea Star beach cabin retreat. 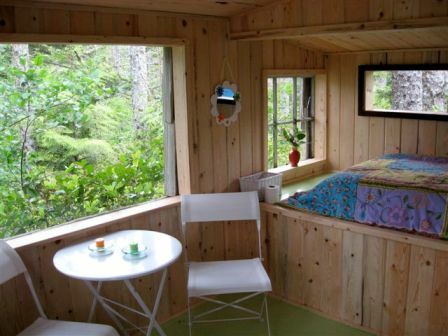 This roomy 16'X20' cedar-shake vacation accommodation, is ensconced amidst the towering dune spruce and comes fully furnished with a queen size and a fold-down bed. It sleeps 4 adults. The cabin is equipped with cold running water, propane heat, light and cook stove. 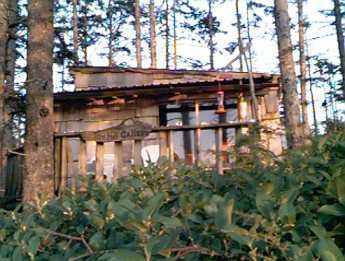 this beach cabin retreat is only a 3 minute walk from lovely North Beach, 10 miles east of Masset on the Queen Charlotte islands, BC. FEEL ONE WITH NATURE as the sun shines through the big bay window and the young dune spruce hover over the foliage of Sword ferns and Salal bouquets as they wave their welcome in this south-facing Sand Dollar cabin retreat. 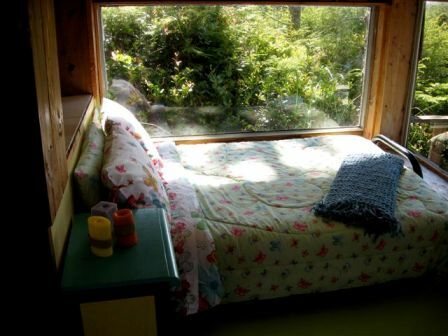 A perfect place for morning coffee or watching the dancing stars while lying on the day bed upon nightfall. This tongue and groove pine paneled cabin features two separate rooms with fully furnished kitchenette, dining area and day bed on top level and a pillow top double bed and a fold-down sofa on lower level. 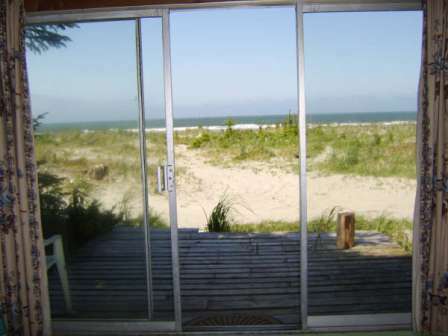 The Sand Dollar cabin is equipped with cold running water, propane heat, light and cook stove. It is a two minute stroll to get your toes wet in the playful surf. Now offering off-season weekly and monthly rates for rentals between October 1st and March 31st (excluding holidays). We have services available to alleviate the stress, effort or astronomical expense that usually accompanies some of these events. Without the worry of details you may also want to schedule a treat for yourself with a much deserved relaxing massage.